Scale model is a children's toy or collectors model of any object found in real life, though it is usually restricted to scale cars and vehicles of all kinds. How it is laid out is like this, the 1: before any number represents the full size subject, well any number that comes after the 'colon' is the scale model size. So to put it lightly, the - 1: - is the real life size subject, well the - : - divides the real life item to the scale model, from 1 up to an unlimited number. And to be clear, the the higher the number, the smaller the scale model becomes. If we have a 1:1 scale model, then this is - well not technically a scale replica - perhaps incorrect, as its not scaled down at all, as the replica will be the exact same size as the original - any number after this is guaranteed as scale model. The reasoning behind scale models is so manufacturers of all kinds can accurately set the real life item to a smaller model. This helps with designing related items that are sure to fit and accessories that will measure up in the correct size. You see, if manufacturers of scale models simply wing it, then a tractor for example may be far to small to tow a trailer - with the hitch to low down to the ground. So instead, if you scale down all subjects to a given scale, then in theory everything will fit once it is all put together as a scale model. There are no hard or fast rules when it comes to laying out scale in terms of text. To divide original object from a scale model you would use a full colon, some may use a forward slash or a dash, well others may not leave a symbol at all, just an empty space. If we take the available layout symbols for you - using 1:9 scale to demonstrate - it would look something like this. Well that would come down to where you are in the world, without a doubt the most used scale model in the UK is 1:32, and has been for decades. We can say for certain 1:32 in the United Kingdom is the most popular, resulting in the most used. But for other countries, the most used doesn't mean most popular. All that tells use when a scale is most used is that the toy manufacturer releases the biggest range in the set scale of their choosing. Though we do admit, a most used scale model can result in it becoming popular. Here's a table to demonstrate what scale is the most popular in the world, starting from the most popular to least favourite, in what country. We've weeded out the top seven popular scale models and put them to the test, as we demonstrate how they are measured in scale using examples, along with an intro. We've taken average length of any given subject that relates most to the scale; for example, tractors, cars, cows and people - then set our scale measurements to that. This is not a sure thing mind you, any object can very size so naturally the results will vary, but we do hope to provide accurate results on the information we have at the time. Let's go into a bit more detail by giving you 7 examples of understanding what is a scale model - though you should start to get an idea as you read each example. Usually reserved to Siku Farmer series and perhaps matchbox-type toy cars, this scale model size is miniature, so mini in fact that vehicles are restricted with functional parts. Its also known as H/O scale, and used in the model train industry to scale out trains sets along with the equipment to setup dioramas. As its popular with model train hobbyists, lets layout an example using a single train car. Example 1: a real life British Rail Class 390 Pendolino is 966 inches in length. If we simply divide that by 87 (hence the scale we're working on) then the result is 11.1 inches. So the scale model train car is now 11.1 inches - or there about's with 100% accuracy. This size again is usually restricted to the Siku super series, and well not small as the scale measured above, its as small has you'll get in the scale toy world. Oddly, we associate it with Siku series despite it not being officially announced, but by appying the same rules as our demonstration, its not hard to find out ouselves. Available with all types of toy vehicles, for this example, lets take a simple real life van. Example 2: taking a real Ford Transit Long Wheel Base High Top van, it on average measures 226.378 inches - divide that by 72 inches and the result is: 3.1 inches. That's it then, a Ford Transit van would be 3.1 inches in length if it was 1:72 scale. Almost exclusive scale popular with the ERTL brand in the United States, with a limited number of models in 1:64 scale found here. 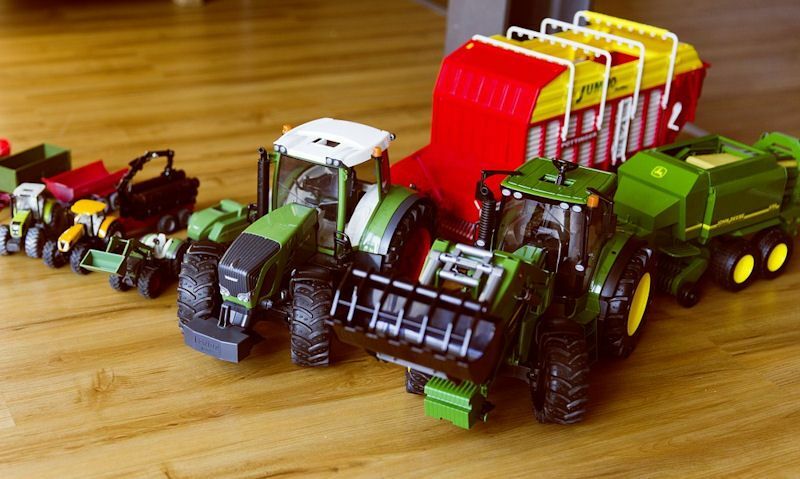 All scale farm toys are set in this size, with both inferior plastic to quality die-cast models sharing this scale. Example 3: in this demo will be using a vintage style John Deere 4020 tractor at 151 inches. Divide that by - yes you guessed it - 64 and we end up with a 2.35 inch long model. This result then relates to all similar John Deere vintage model tractors in 1:64 scale. The most popular scale model within the UK and Europe, with toy brands Britains to Siku almost exclusively releases models in this scale. And a flexible scale it is to, thanks to the vast array of model farm toys in the scale, and where there's a tractor or vehicles, there's always a trailer or farm implement to tow. As its popular in the UK, let's use a well-known British manufacturer to help demonstrate scale 1:32 - and so will go with a JCB machine. Example 4: take a JCB Fastrac 3170 tractor at 204.7 inches in length, divide that by 32 and the answer is: 6.39 inches. So if you have a Britains Fastrac toy sitting around, get out the tape measure and you'll find it to be similar to this number - give or take few digits. Or to be more precise, all big, chunky toy farm animals and children's model horses. Though remarkably, you won't see this scale labeled on any toy we mention. Why's this then? well we've had to work it out for ourselves as brands don't make their farm animal toys in scale. And when we say brands, what we're really talking about is what scale are Schleich farm animals, and like rival brands, do not release their series of toys in scale. Well not planned from the very beginning, people have figured out that Schleich animals are in deed 1:24 scale; likewise so are Bullyland horses and similar animal figures. It only makes sense then to demonstrate using an average black and white cow length. Example 5: take a popular Friesian cow that measures from nose to tail at 120 inches, then divide that by 24 and the result is: 5 inches in length on the dot. A scale almost exclusively used by Bruder and Britains Big Farm farm toys, well brands who develop intricate models for collector's adore this scale also. Why, well 1:16 scale is big, so big in fact it allows for the wheels to be steerable, access to the cabin via the opening doors, and an opening bonnet and lots more features. There's a draw back though, with Bruder farm toys, size restriction applies, meaning space will be needed to maneuver around tight corners in the home. Likewise, well the Britain Big Farm series is good for sounds and realistic engine noises, towing Big Farm trailers will result in more space needed. Well both brands release Land Rover Discovery toy vehicles regularly, lets use them for our next demonstration. Example 6: take the average length of a Land Rover Discovery 3 at 190.9 inches, divide by just 16 this time, and the result is: 11.93 inches long. There you have it, if Bruder and Big Farm do it right, the Discover 3 should be about 12 inches in length, though features like a bumper could extend this. We've skipped past 1:12 scale as the next logical example, but seeing as Breyer dominate both scale with 1:9 being far more popular, let's talk about his scale instead. And like we say the Breyer Traditional series have complete reign over this scale for their model horses and related accessories. As big a scale it is, you'll very rarely be able to find vehicles in this size. Let's get right into it then, will do what Breyer have to do at some point when making there next model horse, and that's finding out the length to start with. Example 7: average length of a horse is 94.48 inches, divide that by only 9 and the result is a resounding:10.49 inches - quite a big one hey. And there you have it, we've put 7 examples together to help you understand what is a scale model, with real demonstrations based on real life subjects. Well we've talked you through only dividing the length, remember to get an accurate picture of a any scale model - as all dimensions will need to be taken. Before it was all done by hand, these day's sophisticated computers do all the work. And it doesn't end there, for example, on a tractor dimensions are only taken from back to the front chassis; then measuring the curvature, roundedness and other complicated measurements are taken. In case of an animal or person, taking dimensions is much easier.